Home → North Carolina → Is the 2016-2017 Flu Season here in September? According to the CDC, the flu season picks up in October. Of course, this varies around the United States due to location, and of course the strain of the flu. 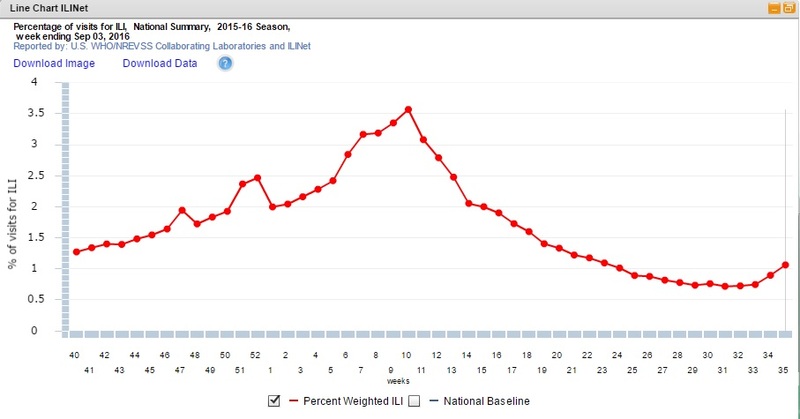 In North Carolina, over the last 3 years, influenza has been most prevalent from October to May, as seen below, image courtesy of flu.nc.gov. Is the flu here in North Carolina in September? While no influenza diagnostic test was done, a doctor told a sick family member today that they believe they had the flu. Unfortunately, I have been unable to find out anything about the flu coming to NC in September this year online. Is it just not online, or is the flu not here yet? It is September 12 2016, and this person has been ill since around September 3. They frequent the Cary and Apex NC areas, just West of Raleigh, although has recently been to Pittsboro, Durham and Chapel Hill. The CDC offers a current US Flu Activity Map, but, it was last updated May 2016. On the CDC’s FluView page, it does show some sort of uptick in flu illness. “Week 35” is the last recorded dot on the chart and is the week ending September 3 2016. Since the CDC and other government websites haven’t listed any 2016-2017 specific symptoms just yet it is tough to say what those symptoms will be. I can say the person I know “with the flu” in mid 30s, has a mild fever just under 100, is fatigued, tired, runny nose, and a mild cough. Do you think you have the flu? I want to hear from you! Please comment below if you are in North Carolina or beyond and are experiencing flu like symptoms. I only found some news online about the flu hitting some college students in Texas and someone in Arkansas complaining on Twitter about possibly having the flu. Hi Len, I live in asheville and two days ago I was in sherwin Williams. Three guys there thought they were coming down with a bug. At first I thought they probably all have ragweed allergies and aren’t aware that it’s ragweed season. But, last night I started getting all the flu symptoms listed and I’m in bed feeling like cr*p. Could this be flu or allergies? I normally just get itchy eyes and nose this time of year, but not flu symptoms. Oh no, I hope that you feel better. The family member that I know that had it was sick for nearly 14 days. The doctor couldn’t do anything to treat it since it wasn’t a virus. It has finally started to clear up. It was mostly a “blah” feeling, lots of bed and sleep, stomach pain, feeling “like cr*p”, etc. Don’t know what I got but I am in Chapel Hill and became very sick today. I can’t get out of bed. In Norfolk, VA. Google’d “flu in September” and ended up here. I have extreme body aches, a mild fever, and painful congestion. Guess the flu traveled north before I could get the shot.